The company physician, PhD, MD Donner, offered influenza vaccination for all volunteers. In addition the health insurance company “Techniker Krankenkasse” offered a “back-check-measurement” evaluating the individual balance between abdominal and back muscles. The “T-wall-reaction-board” made many brave “warriors” sweat. Everyone had to try to switch off the coloured lights appearing on different areas of the board as fast as possible. “Heilbad Krumbad” was this year’s new participant with two experienced therapists, Martin Schmid and Birgid Hader, who disclosed the secret about how to prevent tensions of muscles and malpositions by means of fascia workout. Additionally our fitness partner “FitnessPark Krumbach” made the same approach on tensions of back muscles by means of a special fascia training device. A physical break was offered with sports and economy expert, Mr Pfanz-Sponagel’s lecture “reduction of stress by exercise”. It was fun to follow his lecture on how the human being is split into flight and warrior groups ever since primeval times. Accordingly endurance sports or martial arts are the best ways to work off stress. 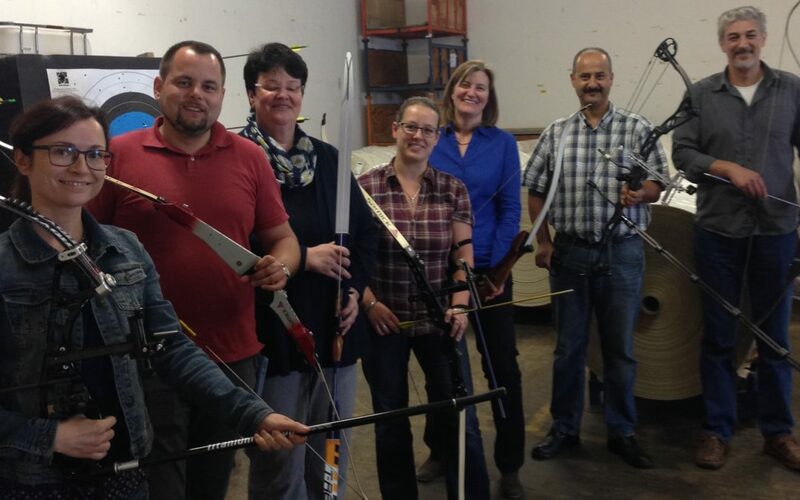 Besides numerous offers for physical exercise the archery club “BSC Hohenrau” was the highlight of the day! Mr Peter Schneider shaped up all the laymen into top form and unerring “American Indians”, even bruises were swallowed in the heat of the battle following the slogan “big boys don’t cry”. The members of staff looked forward to the freshly prepared lunch: red Thai curry with chicken, stir-fry vegetables and basmati rice, the ultimate ending of the menu fresh fruit salad – a well-balanced diet.